The Whole Body Cryotherapy (WBC) is used since the 1980’s, mainly in the northern Europ (Germany, Austria, Finland, Poland, Russia …). This physical medical treatment consists of exposing the largest surface of the body, during a very short time (3 minutes) to a very dry and intense cold (−110° C.). This technique is developed around different fields: muscular and inflammatory pathologies treatments, sportsmen recovery and performance improvement, prevention and relapse pathologies. The aim of the WBC is to generate a thermal shock, which produces a vasoconstriction followed by a vasodilatation of the peripheral vessels and a stimulation of the skin thermo-receptors. This thermal shock has mainly an anti-inflammatory effect by a decrease of the skin temperature and antalgic impact by slowing down the nervous conduction. Different studies have shown the good results on pain reduction, biochemical changes, oxidative stress and depressive symptoms. Methodology We have used a I-DXA system (Dual Energy X-ray Absorptiometry, I-DXA General Electric) to measure fat and lean mass, and a multifrequency bioelectrical impedancemeter (Inbody 720) to analyse the total water, the intracellular and extracellular water. Before the first exposition, the 14 male subjects went through a medical check-up to know the medical contraindications, and then have had 10 WBC sessions at −110°C during five days, twice a day (Zimmer System. Just before the first WBC session, a DXA is realised. The multifrequency bioelectrical impedance is done before each cryotherapy session. During the same half-day, the subjects go through 2 sessions, with a minimum of 2 hours separation, between the two expositions. We have measured the skin temperature before and after each sequence. In the same time the subjects fill out a survey about their subjective feeling with a visual analogical scale. (Sleep, wellness, Soreness, Pain, Fatigue). We have also taken into consideration the diet, the drink consumption and the physical activity. 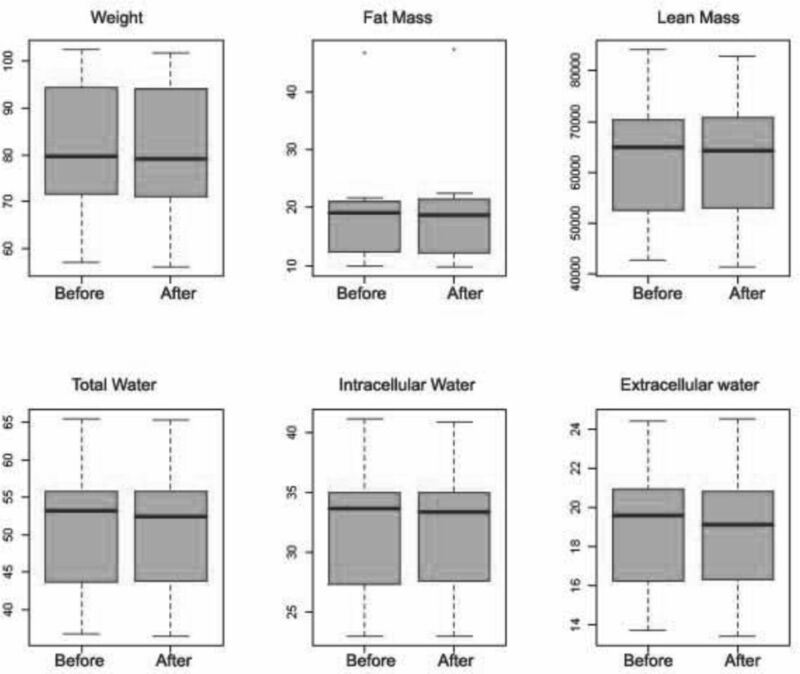 Results The results indicate there are no significant statistical differences between the measures realised before the WBC and after 10 WBC expositions for weight, fat mass, lean mass, total water, intracellular water extracellular water (Fig 1), even if a trend seems to exist between the weight loss and the fat mass, but there is no statistical relationship between these two variables (r = 0.37, ns). The skin temperature after WBC decreases to 10° C at the lower limb, and 15° at the upper limb. We remark a positive effect on Wellness, Soreness, Fatigue and Pain. (Fig 2). The average sleep score (scale 0 to 10) increases from 5.14 before the first WBC exposition to 7,18 after. 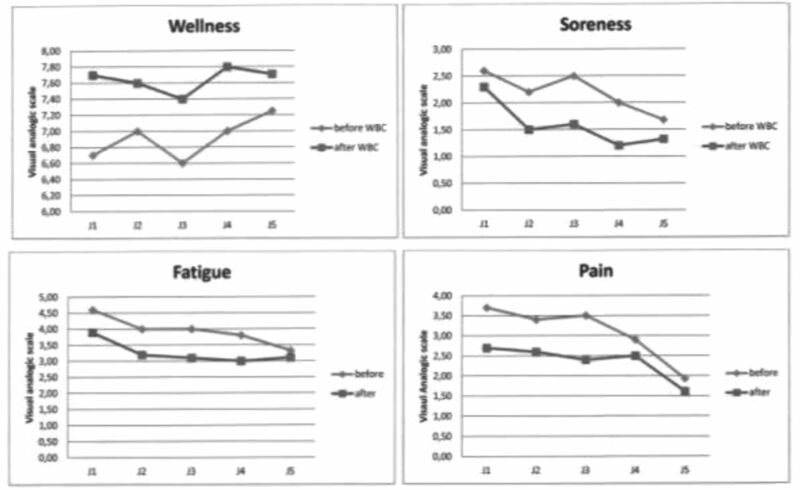 Conclusion These results show that the WBC has positive effects on Wellness, Soreness, Fatigue and pain but don’t reveal a real impact on the body fat loss.